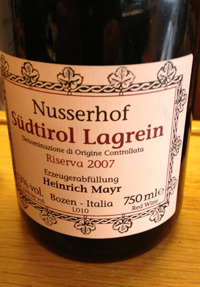 2007 Nusserhof, Lagrein Riserva, Sudtirol-Alto Adige (Heinrich Mayr) Italy. This beautifully crafted Lagrein from the Dolomites reminds of a fine Cornas with earthy intensity and character showing glorious mature blue and black fruits, spice and loads of texture and charm. This is one of the best Nusserhof’s I have had, and it is a stunning example of this varietal with a opaque dark color, lovely aromatics and long seductive finish, this is a Grand Cru Lagrein if there ever was one. The nose has an array of fresh and dried flowers, mountain herbs, black olives, hints of game and pepper leading to a full and dense palate that presents layers of wild plums, blueberry, cherry and huckleberry fruits, mineral notes, truffle and salted black licorice. There is a sense of lifting acidity and chewy tannins keeping things lively on this interesting Italian red and it should age gracefully for another 5 to 7 years, but I would suggest drinking it sooner, it is too good to wait.